Network with professionals using our ready-made human resources list, a huge directory of potential sales leads, including phone numbers, emails, job titles, and more! Find and market to those working in HR departments at many different companies and institutions now using our directory. Human resources is a multifaceted, nuanced, and ever-changing field with many different needs. Often dealing with the organization of confidential employee information, providing benefits and pay, managing onboarding and terminations, or taking care of many other important business functions, highly qualified HR managers and professionals must use many types of organizational software, services, or tools. If you have a solution that can help companies with human resource management (HRM), let them know about it with this ready-to-download HR email list. 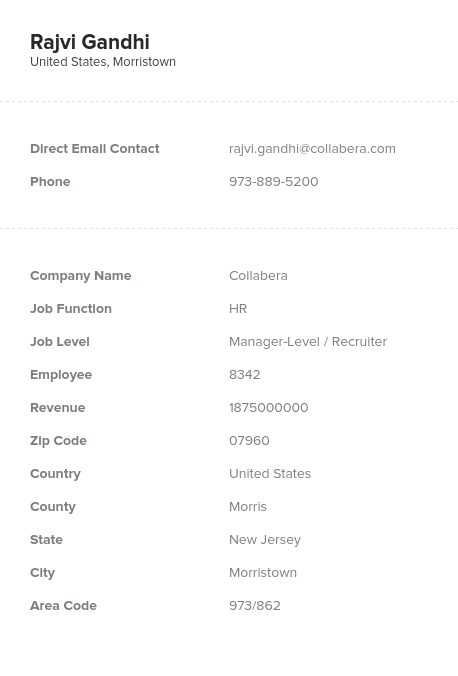 This targeted HR contacts database is pre-built and ready for you to integrate into your CRM moments after purchasing. It contains the key contact information of professionals working within human resources at multiple organizations across many industries. Find better leads and start making connections. Remember that we don't provide generic email addresses (such as [email protected]), so you'll be able to build stronger business-to-business (B2B) relationships by being able to email leads with direct contact information. This verified human resources email list also includes address information, so you can use it as your HR mailing list as well. Start marketing to HR managers, staff, or even senior executives now. To narrow your sales leads even further, feel free to customize and build your own targeted human resources list with our list-builder tool. Buy this premium ready-to-download database if you want to communicate with HR decision-makers!